We made it to our last day of the Twelve Days of Turtles! 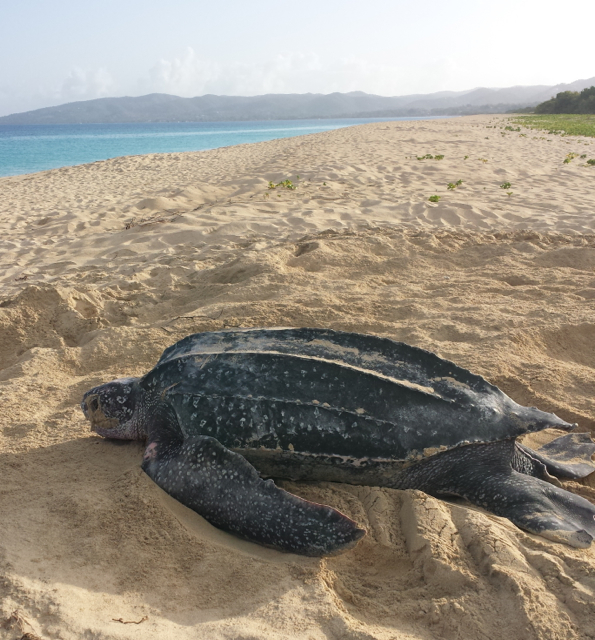 Today, we encourage you to follow us next season as we track some leatherback turtles around St. Croix and through the Northern Caribbean. Last year our turtle Enid Fern (a new nester at St. Croix) ventured over to Maunabo, Puerto Rico where … More Twelfth Day! Follow our Turtles! Leave a comment Twelfth Day! Follow our Turtles! In 1984, after much lobbying and hard work by local agencies, volunteers and departments, Sandy Point officially became a National Wildlife Refuge created specifically for the protection of the Leatherback Sea Turtle (scientific name: Dermochelys coriacea) (the first refuge created for sea turtles), and is managed by the US Fish and Wildlife Service. The recognition of … More Eleventh Day of Turtles – The History! Leave a comment Eleventh Day of Turtles – The History! Come see us this Sunday 9 December 2018 for Christmas Spoken Here at the St. George Village Botanical Garden on St. Croix. We will be answering questions about The Leatherback Project, and we’ll have some fun surprises and games for you to play. We will also have some small gift items for sale, as well … More Christmas Spoken Here for Tenth Day of Turtles! Leave a comment Christmas Spoken Here for Tenth Day of Turtles! Name a nesting turtle – Each season we see dozens of individual female turtles and while they have flipper tags, we like to give them names to remember them better as the season goes on. For example, SPP056 is one of our special turtles. She nested twice in 2016 and one of our team members, Dana, … More Name a turtle on the Ninth Day of Turtles! Leave a comment Name a turtle on the Ninth Day of Turtles! We could not do the work we do without so many people! The following organizations, individuals and project partners support our work – with sponsorship, financial donations, time, volunteers, and most of all, words of encouragement. Thank you so much! Please do your best to support them in return – they do so much for … More Eighth Day of Turtles – 2018 Supporter Shoutout! Leave a comment Eighth Day of Turtles – 2018 Supporter Shoutout! It’s become so automatic (at least in the US) to get a straw with your drink that we rarely think about it. We are so used to the paper-covered straw sticking out of our drink. But straws are one of the most common items picked up during beach cleanups. And they do harm marine wildlife … More Straw Challenge for the Seventh Day of Turtles – SKIP IT! Leave a comment Straw Challenge for the Seventh Day of Turtles – SKIP IT! For our Sixth Day of Turtles, you can adopt your very own leatherback nest for a donation of $50 to the St. Croix Leatherback Project, through Sea Turtle Census at The Ocean Foundation. You will get a personalized certificate you can print (for anyone you choose), a project sticker and updates when your nest hatches. … More Sixth Day of Turtles – Adopt a Nest! Leave a comment Sixth Day of Turtles – Adopt a Nest! No doubt you’ve seen a lot of information lately on the problem of plastic debris – the Great Pacific Garbage Patch – marine animals becoming entangled in discarded plastic – and our sea turtles dying from eating plastic, which they have mistaken for food. The problem is real. The only way to slow it is … More A challenge for the Fifth Day of Turtles! Leave a comment A challenge for the Fifth Day of Turtles! Fourth Day of Turtles – Get our t-shirt! We live in our t-shirts! And you can get one too! We sell our project t-shirts to raise funds to support our volunteer research assistants. For just $20, you can wear the same shirts that our team wears! We have a number of colors and sizes available. There’s a large logo on the back of … More Fourth Day of Turtles – Get our t-shirt! Leave a comment Fourth Day of Turtles – Get our t-shirt! Third day of turtles – Volunteer with us! Each year, at least 40 volunteers help our teams, as research assistants, beach cleanup crew, nighttime surveyors, nest protectors, turtle watch helpers and many more tasks. We could not do all the sea turtle research and monitoring we do without volunteers! You are most valuable to us! If you are on St. Croix and can … More Third day of turtles – Volunteer with us! Leave a comment Third day of turtles – Volunteer with us!